_ The Grand Illusion Show...a fast paced show performed by world traveled magician Mark Clark, this show can be themed for any occasion or holiday, and it is perfect for corporate events, shopping malls, and fundraisers, and can also be tailored for schools and camps with an educational theme. 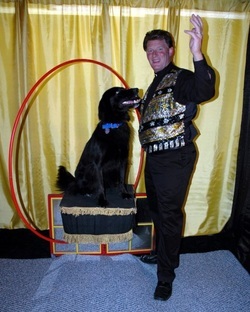 Mark keeps the crowd on the edge of their seats with such feats as Houdini style escapes, mentalism, the production of doves and rabbits, making his lovely assistant disappear and appear, and also includes plenty of audience participation. Show is approximately one hour in length. Watch the video! Show length is approx. 45 minutes in length but can be adjusted to suit your needs. Vaudeville at its best! This show is an enchanting blend of comedy, magic, and circus skills. You’ll be amused and amazed as these jesters present sleight of hand and illusions. In a brilliant barrage of laughter, these buffoons bat and bounce their way through a nonstop array of gags guaranteed to bring giggles and gasps to young and old alike. __ From a high school grad night to a fund raiser for your organization, this show will be a success at any event or venue. Mark and Georgette Clark orchestrate a fun filled night where your guests are the stars. The committee - picked from volunteers - will be lead through a fantasy tour that they will see, hear, and feel without ever leaving the safety of the stage. They will feel they are experiencing such things as a rocket trip to Mars, winning a $10,000 prize in a horse race, and becoming their favorite singer. There is no limit to their imagination. See our video! _ A great way to entertain your guests! Choose from a magic show and balloons (approximately 1 hour in length) or face painting and balloons (approximate length is 1.5 hours). Princess Parties and Magic “tutorial” parties are also available! Check out our Party Packages for more information. Other themes can be accommodated!